What is Jaromir Jagr worth? There's no real consensus on this question. In a recent Twitter poll, almost half of respondents figured he should be in the $2.0-$3.0 million range, but a significant minority felt that he should be in the same, $1.0-$1.5 million range as other veteran free agent forwards this summer, like Mike Cammalleri, Patrick Sharp, Jussi Jokinen, and so on. It's obviously a contentious issue, because a few people even took exception to the very question that Jagr could be worth less than $2.0 million. Well, sometimes the cold, objective eye of hockey analytics can provide a little bit of insight. What is he worth, based on the underlying numbers? Years ago, I built a model to help establish each player's value, relative to their contracts. It involves capturing a player's performance in a single statistic (like GVT or WAR), and then establishing his current level of performance by taking a weighted average of the three most recent seasons, and then regressing it towards the league average (usually by just under 20%) to remove the impact of random variation. Then, a natural aging curve is applied, but that is obviously impossible in Jagr's case due to the lack of historical precedent. Finally, the player's value is determined by comparing this end result to what a team could get (or needs to get) with the same cap space. If you want more detail, this is all explained in the opening chapter of Stat Shot. 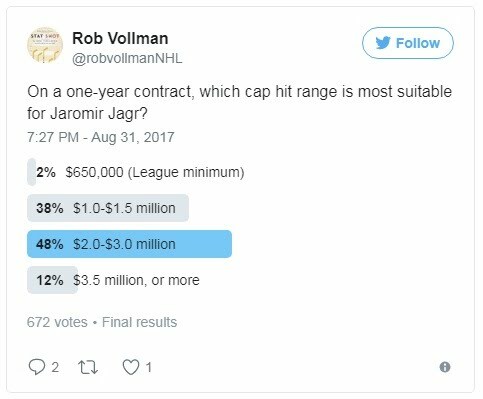 From this perspective, Jagr is easily worth at least $2.0-$3.0 million. In fact, it's not ridiculous to suggest that he's still in the same, $3.5-$4.0 million range that he has been paid for the last three seasons. In other news, I did a Reddit AMA this week, my third one. I got some good questions, so check it out. In the comments, I learned of a new statistical hockey database called Icy Data. It has a lot of the standard stats you can get elsewhere, like Corsi and such, but it also has some interesting visualizations. Just to take one example, consider the penalties dashboard. Are you curious about which types of penalties are more common than others, how it has changed over time, and which players are drawing which types of penalties? There are some very interesting results. Starting with the 2013-14 season, I used to keep track of everybody's standings projections. In part, it was to get a sense of the mainstream expectations for each team. Whenever there was a significant disconnect between the conventional wisdom and my models, it was an opportunity to dig deeper. Furthermore, keeping this information as a reference is a handy way of knowing which teams out-performed and/or under-performed their expectations to the greatest extent. Well, Dominik Luszczyszyn of the Athletic gathered the crowd-sourced results, and here are the results. Does this conflict with your perspective to any great extent? In my case, I don't have any major reservations. There are certainly a few teams that are a bit too high or too low for my case, but by and large this looks to be quite reasonable. In all those years of tracking the results, I found that we can't really predict the standings any better than simply taking last year's standings. So, consider this more as an informative view of the mainstream perspective right now, and a useful frame of reference against which to compare teams at the end of the season.